Sir Chris Hoy is without any doubt the greatest cyclist of Britain. He has received enormous supports and salutes following his sixth gold medal in 2012 London Olympics. With seven overall medals in Olympic, Hoy became the all time inspiration for all British young cyclists. But you cannot undermine the age factor, especially when you an athlete. Same goes with Hoy also, and now he has started thinking to get his feet off the paddle! The most successful British Olympian recently gave a bite where he expressed his wish to win the Commonwealth gold medal in 2014. Sir Hoy, the first ambassador of Glasgow 2014, desires to end his career after participating at the Glasgow 2014 cycling event which will take place at Sir Chris Hoy Velodrome. Hoy felt lucky to be chosen the ambassador for Glasgow 2014 and asserted that it was a great honor, too. Sir Hoy hasn’t yet started with his training schedules but he said that it would probably the greatest achievement for him to finish his career after competing in the velodrome which bears his name. The 36-year-old Scot will be joining the British team for training soon, but he won’t be competing at the World Championship which will take place in Minsk in February. He admits that he wants to give his career a perfect finish after taking part in the 2014 Commonwealth but at the same time he hopes that his body condition allows him to do so! Sir Hoy is not interested in coaching as he thinks it is not his cup of tea. He says once he becomes a coach he will have to train those cyclists who have been his teammates or contemporaries. The other thing that seems to bother Chris Hoy is the kind of time and commitment required for coaching. He feels that a coach has to give more time in a practice session than the athletes themselves. And he is of the opinion that all good athletes do not make a good coach. The 29-year old Spaniard Alberto Contador is focusing on the 2013 Giro d’Italia. Contador attended the course presentation of 2013 Giro few days back and there he expressed his wish to participate in the Italian Grand Tour in 2013. Contador returned from a two year doping ban back in August and since then he looks promising as he won the Vuelta a Espana and the Milan-Turin race. The Saxo Bank-TinkOff Bank rider also said that his primary objective would be to win the Tour de France next year but he would like to take part in the Giro because he felt that the track is pretty good to ride. Alberto Contador expressed his opinion that the Giro race would be a tough one right from the beginning because some of the toughest climbs are there at the start of the race. He thinks that the team time trial and the Mountain Time trial will make a crucial effect. He then adds on that the final week of the race will be a great one as it demands some of the toughest finishes. Contador is quite sure that the Giro would suit him quite well. But he is not absolutely sure of participating in it because he doesn’t know his schedule for the next year. He chooses to wait and see his programs of the upcoming season and then he will decide whether to take part or not. Alberto Contador has five Grand Tour titles in his bag which includes one Giro d’Italia in 2008, a couple of Vuelta a Espana in 2008 and 2012 and two Tour de France in 2007 and 2009. He is making the 2013 Tour de France his bird’s eye and desparately wants to win it. It has been a disastrous season for Team Lampre-ISD. Now with the Tour of Beijing approaching, they hope to end the season with some success under their belt. It has been announced that Alessandro Petacchi will be leading the team in the race. According to the score sheet of International Cycling Union (UCI) the blue-fuchsia team from Italy is positioned at the 14th spot out of 18 teams currently. They managed to get only eight victories this season and there is no World Tour victory in that. It looks like that they are under no serious threat as four other teams follow them but Giuseppe Saronni, the general manager of the team, is hoping to improve his team’s reputation by putting up a good show. The former world champion, Saronni is not satisfied with the results of his team and said that the Beijing Championship would be of a great importance for is team. As the season approaches its end the Italian team desperately wants to wrap it up in a winning note so that they can carry some points in the World Tour ranking. Alessandro Petacchi has secured three victories under his belt this year and he is the most successful rider of the team. “Ale-Jet” is all set to lead his team in Beijing and expecting a good result. Petacchi is considered to be one of the best riders in the peloton and it seems that the Beijing race course will suit him pretty well. Alessandro Petacchi will be joined by lead out cyclists Davide Cimolai, Davide Vignao and Grega Bole whereas Manuele Mori and Daniel Pietropolli will be focusing on the breakaways. Morris Possoni will take up the responsibility of the uphill course. Petacchi’s team will also feature Adriano Malori. The UCI has made the official announcement that no other doping sample taken during the Tour de France has returned a positive result after the complete analyses, leaving Luxembourgish rider Frank Schleck as the only rider in this year’s Tour de France to have a positive result in the dope tests. The governing body of cycling made a statement where they claimed that the CADF or the Cycling Anti Doping Federation has received all the final and complete results of the random dope tests that were carried out during the event last July. The samples that have been received from the laboratories of Lausanne, Chatenay-Malabry, as well as Cologne have all showed negative results, according to a stamen that has been released by the governing body of cycling. However, this news comes after it was confirmed that Frank Schleck of Team Radio Shack Nissan had returned a positive sample to his dope test after the 13th stage of the Tour de France that was held in July, 2012. 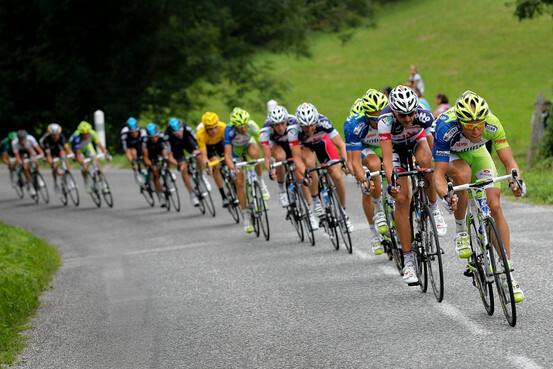 The 32 year old cyclist from Luxembourg was found guilty of having Xipamid, a diuretic in his system. This substance is included in the list of banned substances by the World Anti Doping Agency or the WADA, which can be used sometimes as a masking agent. The 32 year old, however, denied that he had taken any performance enhancing drug during or before the Tour de France. His B-sample was also found to have returned with the same positive result. He has been sanctioned from racing further this year, meaning Frank Schleck will not be able to race at the USA Pro Cycling Challenge that is taking place currently and his case has also been referred to the Luxembourg Anti Doping Agency which forwarded it to the disciplinary committee, where Schleck awaits a hearing.